I was born in the month of May. It makes me a Taurean. The zodiac sign is that of a bull. I am not a believer in Astrology. I believe there are more important factors which determine our future like socio-economic status, quality of parenting received, access to education and healthcare etc. I have been compared to a bull in my childhood. This was for being lazy, stubborn, willing to engage in argument and of course being plump. I have changed a lot, in fact I had to change a lot. I would love to be lazy but CMC Schedules do not give a chance. I cannot be stubborn as I see my own view as a spot in the dimension of truth/ falsity. I still love argument as the test of clarity of thought.The word argument is a bad word socially as people take things personally, so I intentionally exit after making initial remarks. I still remain on the right of normal curve when it comes to body weight. In other words I have been fighting the bull and I still need to. I got reminded my self of the concept of fighting the bull and I thought I ll paint a bull fight scene around my birthday. The painting above is the product of that. I loosely applied chrome yellow and lemon yellow on few spots on the wet paper. Then I added yellow ochre, carmine and vermillion to blend along the sides. I then added burnt seinna in corners and did some blending with brush. I then did the same with a bit of burnt umber too. 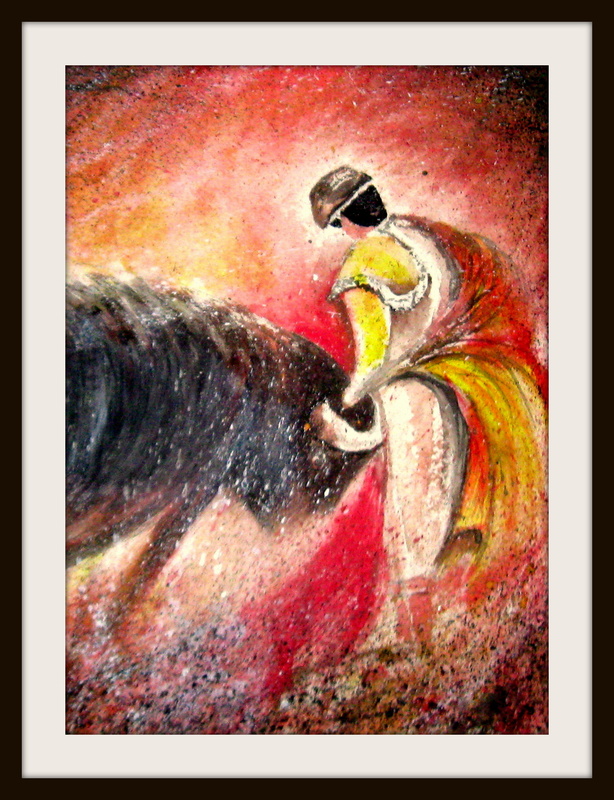 I was adding these colors into the body of the bull with brush strokes following the body contours of the bull. I preserved some whites for the bull’s horn and fighter’s dress. I worked on the fighter’s dress with a small round brush but kept it loose. I added thick paint of burnt umber and then black on the bull following the earlier brush strokes. I also added a bit of white to add texture. Once the painting dried I splattered the painting on the top corners and the bottom with different colors. Some splatter went and fell on the bull and the fighter. This gave the feel of dust and an atmosphere of action. This entry was posted on May 20, 2012 at 6:16 pm	and is filed under art. Tagged: art, astrology, childhood, painting, personality, watercolor, zodiac. You can follow any responses to this entry through the RSS 2.0 feed. You can leave a response, or trackback from your own site.